BJT was invented in 1948 by William Shockley, Brattain, and John Bardeen which has remolded not only the world of electronics but also in our day to day life. The Bipolar junction transistors uses both charge carriers that are electron and holes. Indifference the unipolar transistors such as field effect transistors use only one kind of charge carriers. For the operation purpose BJT uses two semiconductor type n-type and p- type between two junctions. The main basic function of a BJT is to amplify current it will allow BJTs are used as amplifiers or switches to produce wide applicability in electronic equipment include mobile phones, industrial control, television, and radio transmitters. There are two different types of BJTs are available, they are NPN, and PNP. The Bipolar junction transistor is a solid state device and in the BJTs the current flow in two terminals, they are emitter and collector and the amount of current controlled by the third terminal i.e. base terminal. It is different to the other type of transistor i.e. Field effect transistor which is the output current is controlled by the input voltage. The basic symbol of the BJTs n-type and p-type is shown below. 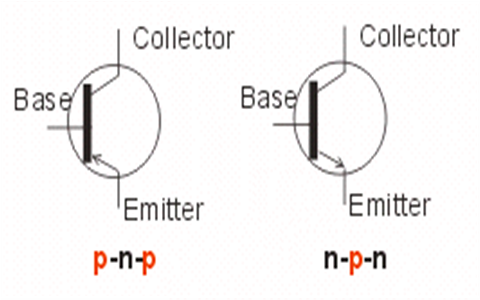 In PNP transistor, the emitter is more positive with base and also with respect to the collector. The PNP transistor is a three terminal device which is made from the semiconductor material. The three terminals are collector, base, and the emitter and the transistor are used for switching and amplifying applications. The operation of PNP transistor is shown below. Generally the collector terminal is connected to the positive terminal and the emitter to a negative supply with resistor either the emitter or collector circuit. To the base terminal the voltage is applied and it operates transistor as an ON/OFF state. The transistor is in OFF state when the base voltage is same as the emitter voltage. The transistor mode is in ON state when the base voltage decreases with respect to the emitter. By using this property the transistor can act on both applications like switch and amplifier. 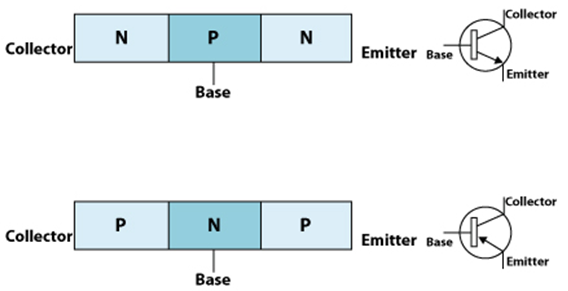 The basic diagram of PNP transistor is shown below. Generally the positive supply is given to the collector terminal and the negative supply to the emitter terminal with a resistor either the emitter or collector or emitter circuit. To the base terminal the voltage is applied and it operated as an ONN/OFF state of a transistor. The transistor is in OFF state when the base voltage is same as the emitter. If the base voltage is increased with respect to the emitter then the transistor mode is in ON state. By using this condition the transistor can act like both applications which are amplifier and switch. The basic symbol and the NPN configuration diagram as shown below. The Hetero bipolar junction transistor is also a type is the bipolar junction transistor. It uses different semiconductor materials to the emitter and base region and produces hetero junction. The HBT can handle the singles of very high frequencies of several hundred GHz generally it is used in ultrafast circuits and mostly used in radio frequency. Its applications are used in cellular phones, and RF power amplifiers. Here the operation of PNP transistor is same as the NPN transistor the only difference is only holes instead of electrons. The below diagram shows the PNP transistor of the active mode region. 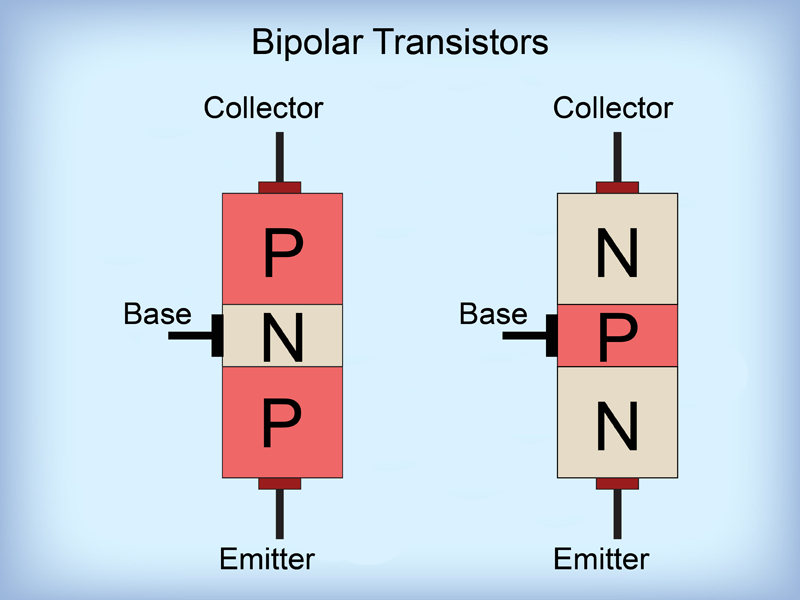 This article gives the information about what is a bipolar junction transistor, Types of BJT, advantages, applications and characteristics of the bipolar junction transistors. I hope the given information in the article is helpful to give some good information and understanding the project. For furthermore, if you have any queries regarding this article or on the electrical and electronic projects you can comment in the below section. Here is a question for you, if transistors are used in digital circuits they generally operate in which region?